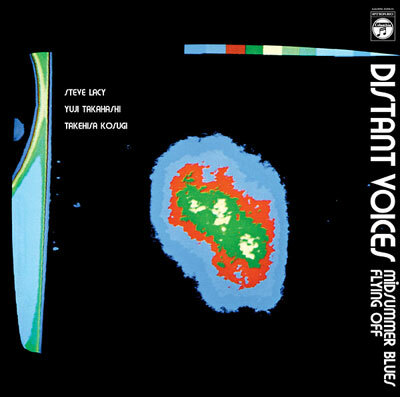 " Aguirre Records present a reissue of Distant Voices, Steve Lacy's rare Japanese collaboration album, originally released in 1976. Renowned for remarkable solo concerts that confirmed his mastery of the soprano horn and that carried its instrumental language into previously unexplored regions, Lacy also loved to collaborate with musicians who could inspire him to stretch the boundaries of his own artistry. During the summer of 1975 Lacy toured Japan, and on June 24th he entered a Nippon Columbia studio in Tokyo with Yuji Takahashi and Takehisa Kosugi, two adventurous kindred spirits, guaranteed to fire Lacy's creative imagination. The fascinating outcome of that dynamic session is Distant Voices, an album without parallel in Lacy's extensive discography. Composer Iannis Xenakis was so impressed when he heard Yuji Takahashi playing piano in 1961 that he later wrote music especially for him. His repertoire extends back to Bach and Purcell yet for Takahashi, music has remained an open quest and a process of discovery. Takehisa Kosugi on the other hand has been a legendary figure in the international avant-garde since the mid-1960s when his work was endorsed by the fluxus movement. In Japan he was by then already well established as leading practitioner of experimental music and intermedia performance art. At the time Distant Voices was recorded Kosugi had also developed a following for his electric violin playing with the Taj Mahal Travellers, a group whose sound had strong stylistic affinities with psychedelic rock and space music. Subsequently other audiences worldwide came to know Kosugi through his long association as a composer, performer, and musical director with the Merce Cunningham Dance Company. On 24th June 1975 Takahashi sat at a grand piano, with celeste and vibraphone alongside him and small bells attached to his hands. Kosugi was equipped with violin, flute, mouth organ, an electronic modulator, porcelain bowls and at times he used his voice. Lacy played soprano saxophone, of course. Now and then he pressed the mouth of the instrument against the skin of a kettle drum. He occasionally fiddled with a transistor radio, and also found uses for a stepladder, a toothbrush, and a spinning wheel. This was in no sense a routine musical session. Distant Voices preserves a unique occasion when three singular musicians joined together to embrace the unknown. Licensed from Columbia Japan. Remastered and lacquer cut by Rashad Becker. 180 gram vinyl." Recorded June 24, 1975 at Nippon Columbia No.1 Studio, Tokyo. Remixed on September 30, 1975.